We don’t see many cottage loaves today. Even in the early 20th century, when Woolf was writing, they were going out of fashion. It’s believed they were originally shaped to save space in an oven — rising vertically instead of spreading out over the oven floor — but their unusual dimensions make them harder to cut or use for a sandwich. 1. In a large bowl, sift together flours and salt. In a small bowl, dissolve yeast in water. Add to flour mixture and stir until dough forms. Let rest 10 minutes. 2. On a floured surface, knead dough briefly, then return to a greased bowl and allow to rise 1 hour at room temperature. Cover bowl with plastic wrap and refrigerate overnight. 1. Remove the preferment from the refrigerator, cut into 8 wedges, and let sit 1 hour until it reaches room temperature. 2. In a small bowl, dissolve yeast in water. In a large bowl, mix together preferment, dissolved yeast, flours, and salt until a rough dough forms. On a floured surface, knead dough 10 to 15 minutes until smooth and elastic. Place in a greased bowl and let sit in a warm place 30 minutes, or until it has doubled in size. 3. Divide dough into 2 pieces (with 1/3 and 2/3 of the dough respectively) and form into tight balls. Place rounds on a greased baking sheet and set 10 minutes. 4. Preheat oven to 425°F. Place the smaller round on top of the larger round. Push a floured chopstick (or wooden spoon handle) completely through the center of the top round and 2/3 of the way into the bottom rounds to join them. Slash both rounds. 5. Bake 40 to 45 minutes, or until golden brown and loaf makes a hollow sound when tapped on the bottom. Congratulations! I’ll be emailing/Facebook messaging you shortly so your books can find their new homes. Thank for this. I absolutely adore Viriginia Woolf, I have a giant photo of her in my bedroom, and your selection of quotations is great! Another lovely post. And I learned something. Cottage loaf! Who knew? Happy birthday, Virginia Woolf. Oh, I love, love, love Virginia Woolf. Like Darya, I have a photo of her, but it hangs in my office, watching over me as I write. I like to imagine her banishing any angels of the house from the room while I work, shooing them away. While I’ve read most of her journals, I never knew the solace she took in cooking. More reasons to love her. Lovely post. 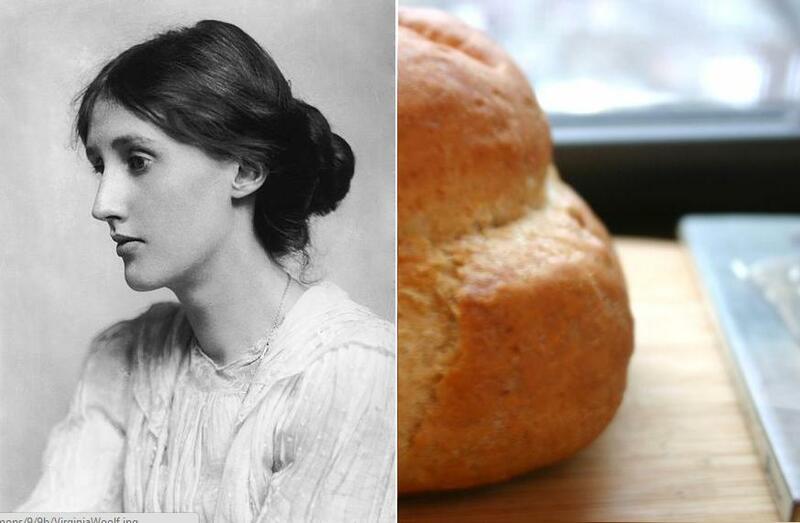 I feel soothed just by *reading*about Woolf’s cottage loaf. I really enjoyed this post, especially her mantra “my bread bakes well.” Thanks for sharing this. Thank you also for this–I never knew Virginia Woolf loved to cook! Lovely! I took a Virginia Woolf seminar in college where we read all of her novels and many of her journals and letters. It was heaven! Thanks for bringing me back to that time. Loved this blog. I remember visiting Monk’s Cottage. I live in the Blue Mountains of NSW , where they say the air is so light you don’t need to add yeast to bread dough! what a great idea! love your blog and the concept. keep putting up these great posts! thanks. I love your blog and I love Virginia Woolf. I’m not sure if I love the cottage loaf yet. I heard somewhere that Virginia Woolf started cooking at age 40. Do you know if this is true? Such an interesting idea for a post, never knew Woolf’s talents extended to bread making. Beautiful post! Thank you so much for the link to my blog, appreciated it…. Pingback: Virginia Woolf’s Bread & Butter | feed. dès 20 ans pour repousser l’apparition des premières rides. celebrities both locally and globally. It’s so interesting to me that she got out of her head and into her body/hands that often. I recently read a book saying we should all do as much when too much in our own thoughts. And I find it works as well as meditation, if not better . . . thanks for a great story.